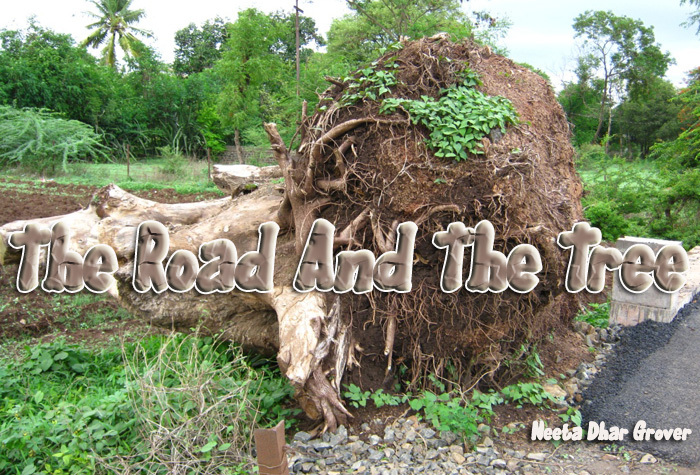 The Road and The Tree is based on a real life incident in Sangli, where you can still see the tree stump lying by the side of the road. Look at it carefully, and you will see the beginnings of new life: an evidence of nature’s law, that everything has to be recycled. Some felled at the knees. As a part of the past. Give them a new bed. Couldn’t keep up the strife. It preys on my mind. But the road is wide. My name is Neeta Dhar Grover. I am a Kashmiri by birth and a doctor by profession. I completed my MBBS and MD from Grant Medical College, Mumbai. I left Srinagar in 1990 with my parents and brother, and am still waiting to back, at least once before I die. I am working as an Associate Professor in Pharmacology in Bharati Vidyapeeth Medical College, Sangli, Maharashtra. 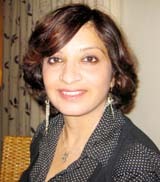 I am married to Dr. Amit Grover, who is a Radiation Oncologist in a cancer hospital in Sangli, where we have settled. We have a six year old daughter called Aanya Grover, who also longs to go to Kashmir and see what snow looks like. I love reading, knitting, browsing the net and painting. Sometimes, when something really touches my heart, I try to express it in a poem. The Road and The Tree is based on a real life incident in Sangli, where you can still see the tree stump lying by the side of the road. Respected Neeta, The poem significantly,depicts on the canvass,of Life,a struggle,to be again a part of its magnificent past,yet not pale and dry out of its own battle to once again stand and bless.. Regards Susheel Tikoo..